The main difference between home and house is that a home is the place where someone lives and where they have an emotional attachment to whereas a house merely refers to a building in which someone lives. Moreover, home is an abstract concept whereas house is a concrete concept. Every human being needs to be loved, cared for and considered important in order for them to move on in a healthy way in their lives. Every human has someone whom they can call as a family, who necessarily cares and protect them from any dangers in their lives. Home is, therefore, the house where one feels attached to and where one’s loved ones reside; thus home is dear to that person. Since home and house may, in many cases, refer to the same building, the only distinction between these two are the way how one feels about that particular place. Home is the place where someone lives and where they have an emotional attachment to. Therefore, home is where one’s heart resides. Home does not necessarily have to be full-furnished luxurious building or an apartment, it can even be a shade under a tree, or next to the special person one loves most in their life. Thus, it is an abstract thing. It is where one finds the warmth of love, caring, affection, peace, and tranquillity, either from the people they love and adore from their hearts or even by one’s own solitude. In brief, home is the place where one belongs to. It can be anywhere on this earth or even inside one’s mind. Therefore, home is more personal than a house. Thus, a home has a more emotional and abstract value than a house. So when one says ‘this is my home’ rather than ‘my house’ it suggests that person has an emotional attachment to that place, so he/she values it dearly to say that they belong there. Therefore, home is the special place where one feels the most comfortable. House is merely a building where one can reside, either with one’s family or by one’s own. However, there is no emotional attachment or value to this place. Thus, house simply means a dwelling either of a family or even a small number of people. Furthermore, there is no emotional attachment to a house. The main function of a house is to provide shelter from danger to its dwellers. Simply, house is a material thing which one can spend money and buy, but money cannot buy a home. So the saying goes ‘You can buy a house but not a home”. Moreover, if someone prefers to call their house a home or their home a house, it indicates the emotional attachment they have to that building. 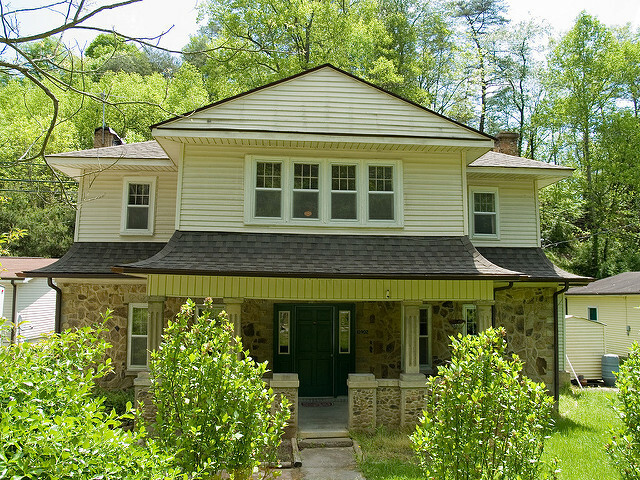 Home and house may be the same building, yet home is where one cherishes from their heart. Home refers to the place where someone lives and where they have an emotional attachment to. In contrast, house merely refers to a building in which someone lives. This is the basic difference between home and house. Home is an abstract concept whereas house is a concrete concept. This is a major difference between home and house. There is love inside a home while there may not necessarily be love inside a place which is simply known as a ‘house’. Home is therefore made with love while house is merely built with material things such as bricks and concrete, etc. Another noteworthy difference between home and house is that a home is essentially constructed upon the sense of belonging while there is no sense of belonging in a house. Family is usually a necessary part of a home while there may or may not be a family in a house. Attachments are what makes us connected to one another. Home and house seem similar at a glance, but home and house differ according to this degree of attachment one possess. 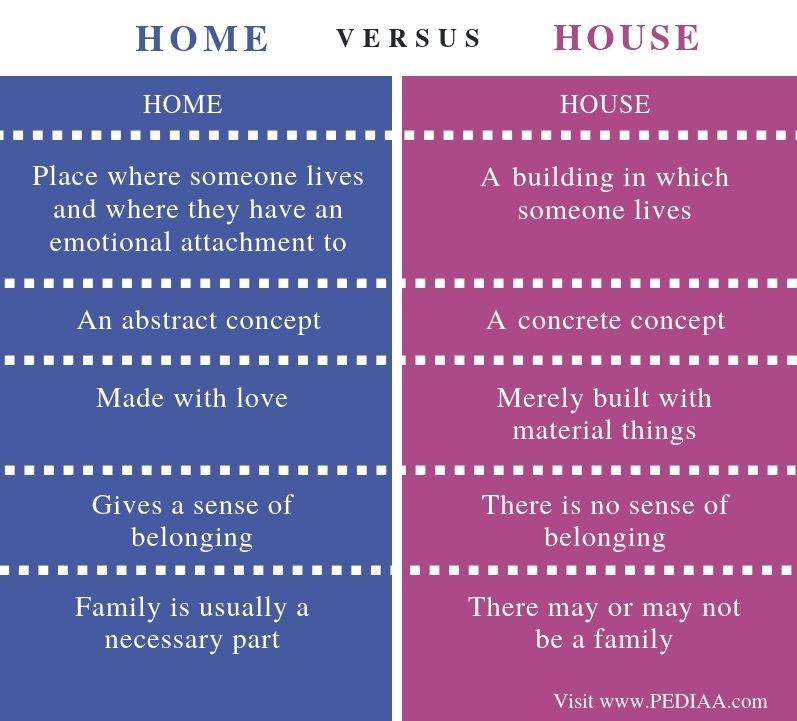 Hence, the main difference between home and house is that home refers to the place where someone lives and where they have an emotional attachment to while house merely refers to a building in which someone lives.